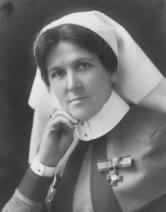 A woman was a member of the QAIMNS wartime Reserve or the Territorial Force Nursing Service; she had no outstanding claims for pension or gratuity; she was over-age (55+) at the time of the weeding process and unlikely to ever serve again, or had died of causes unrelated to her service by that time. Women who went on to serve with the military nursing services during the Second World War – their files will still be held by the Ministry of Defence and the link to find further information can be found lower down the page. There are also a few files that have been mis-catalogued. It's always worth checking the actual TNA Catalogue (details at the start of this section) to look at similar names for likely mis-spellings. Use the 'Search Journals' link, and when using the search boxes, try and keep it as simple as possible – just a surname if it's unusual enough to stand alone. Not all trained nurses get a mention, but it's often possible to follow a woman's career for many years. Nurses who completed a full three year training in England or Wales, and who continued to work after 1922 are likely to have registered with the General Nursing Council as a consequence of the Nurses Registration Act 1919, and their details should be found in at least one edition of the Registers of the GNC which are held at The National Archives in class DT10, and also by the Royal College of Nursing. These Registers contain details of name, number on the register, training school with dates, and address at time of publication. They are held in alphabetical order, but are not available online. Similar records for nurses trained in Scotland are held at the National Archives of Scotland in Edinburgh. British Committee of the French Red Cross - Many women went to France during the Great War to serve in French military hospitals, and most were sent out under the auspices of the British Committee of the French Red Cross. It's thought that after the war all records were deposited with French Archives, but recent enquiries and research strongly suggest that these records no longer survive. However, it does seem to be the case that the British Red Cross Society card index includes brief details of many of these nurses, and an enquiry to the BRCS Archives (link above) is recommended if researching a British member of the French Red Cross. British Red Cross Society; Voluntary Aid Detachments, both nursing and general service sections; Order of St. John; First Aid Nursing Yeomanry; Friends Ambulance Unit; Serbian Relief Fund and the Scottish Women's Hospital. It gives full name, rank/position, passport and certificate number, department and destination. It was re-published in 2004 by Savannah Press, and is available at The National Archives and other large libraries and archives. Scottish Women’s Hospital – a full list of names of women who served between 1914 and 1921 with the Scottish Women’s Hospital can be found by following the link to the SWH in the left-hand margin of this page. Army Nursing Service - Going back in time, a limited number of service records are available at The National Archives for women who joined the Army Nursing Service between 1870 and 1891 in class WO25/3955. Unfortunately there are none for those who joined between 1891 and 1914 unless they went on to serve during the war and have a file in WO399, but their postings to different hospitals can be found by tracing them through copies of the Army List, available at The National Archives, and many other large libraries and archives. The details of each hospital will give you the current location of the records, with scope and dates. Some information is available for trained nurses who went to France with the British Expeditionary Force between September 1939 and June 1940, at which time all medical personnel were evacuated back to the United Kingdom. Lists of names and hospital attachments can be found in at The National Archives WO171/14 and some other unit war diaries. Many of these names can be found by using the 'WW2 Nominal Rolls' link in the left-hand margin of this page. Members of the regular branch of Queen Alexandra's Imperial Military Nursing Service who joined between 1903 and 1926. Nurses who went to France with the British Expeditionary Force in late 1939 and early 1940, returning at the time of the evacuation of Dunkirk. Some of these are women who served during the Great War, and whose files are still retained by the Ministry of Defence. Nurses who served with the Scottish Women's Hospital during the Great War. A newly-published book is reviewed here which will prove invaluable to anyone researching a military nurse - it's thoroughly recommended and well worth seeking out. The Centenary of the Great War seems to have started an avalanche of research into hospitals that admitted sick and wounded military personnel between 1914 and 1919. There were many military hospitals active overseas, and approximately 2,700 hospitals in the United Kingdom that were open for all or some of the period. Most of the home hospitals were temporary 'auxiliary' units, set up specifically for the duration of the war. It's always very hard to uncover any real information unless the house or building itself has good archives, but if there is an answer it's probably in the local area. Overseas military hospitals run under the auspices of the War Office will have unit war diaries held at The National Archives, Kew in class WO95. These diaries are a simple record of the day-to-day running of the unit, and do not mention individual admissions and discharges, though some deaths are recorded. Very few records survive of any of the hospitals that cared for soldiers during the Great War, but an increase of interest is likely to uncover more over the next few years. A frequent check of web links and local archives is likely to be the best way to find out more if it emerges.